The Genealogue: Poe Toaster a Hoax? 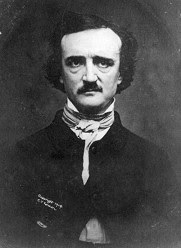 Each year on Edgar Allan Poe's birthday, a mysterious figure dressed in black lays roses and booze on his grave in Baltimore. Sam Porpora, 92, a former ad executive, is claiming that he created the legend. Mr. Porpora's story begins in the late 1960s. He'd just been made historian of the church, built in 1852 at Fayette and Greene Streets. There were fewer than 60 congregants and Mr. Porpora, in his 60s, was one of the youngest. The overgrown cemetery was a favourite of drunken derelicts. Critics say that Porpora may have popularized the legend, but that the mysterious stranger was showing up long before he became involved.